TODAY’S post is the first in a series of v3 season wraps, and I start from the bottom, by looking at the competition’s newcomers, the Wellington Phoenix. OVERALL, a decent season and an improvement on their predecessor, the NZ Knights. Yes, the ‘Nix ultimately finished bottom, in the same position as the Knights did in both their seasons, but a closer look at the table and results shows gradual improvement. Here they finished on the same points as Perth, 20, only 14 from top spot. In the previous years the gap was 37 (v1) and 26 (v2), while the goal difference was -32 (v1) and -26 (v2). This season the goal difference was -12, and while it was a vast improvement, in truth it was the reason they finished bottom. While their attack was competitive (25 goals, equal to the second placed Jets), their defence was the worst, especially through the heart of it, where there just wasn’t enough experience and quality, despite the mid-season purchase of Kristian Rees. The gap is narrowing and Ricki Herbert at times had his team playing some good football, especially in the first half of the season, when the likes of Felipe and Daniel were on fire. The high-point for the ‘Nix came very early, when they beat Sydney, 2-1, away in round four, followed soon after by a 4-1 pounding of Perth in Perth, but they had two terrible months which defined their season. In October they lost four straight, including a 4-1 hiding at Hindmarsh, while in January they rounded off the campaign with three straight losses and zero goals. Away from home they lost seven of their 11 games, something that has to improve, while at home (2 wins, 4 draws and 4 losses) they tended to draw more than they won. At least the crowds and atmosphere at Westpac Stadium were great. Terry Serepisos; for chipping-in, quite late, to rescue the NZ franchise and throwing his dollars behind it. Yellow-fever; Windy Wellington proved it loves its sport, and more importantly from a round ball perspective, loves its football. Excellent crowds, excellent colour, and in the early part of the season, some cracking games, so it’s a pity they only won two of their 10 home games. 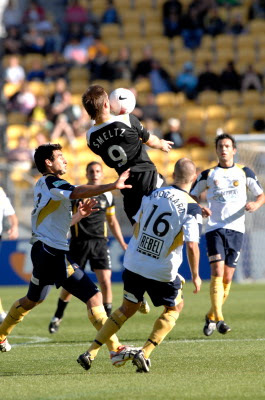 Shane Smeltz (pictured in action above, courtesy of www.wellingtonphoenix.com); Wellington’s player of the season, the returned Kiwi was a constant headache for opposition defenders, proving himself to be surprisingly subtle on the ball, deceptively quick and a pretty decent finisher. Pity he didn’t have enough support. Glenn Moss; with the centre of defence a constant headache, Herbert was lucky he had this bloke between the sticks. Tony Lochhead; one of the success stories in defence, very consistent down the left, doing a good defensive job and proving a decent option coming forward. Daniel and Felipe; very good early, but like the rest of the team, they wilted towards the back-end. Daniel, with his wonderful left peg, started brilliantly but tended to go down too easily, while Felipe looked the buy of the season until opposition teams soon saw to that and started smashing him around, as tended to happy far too often this season to any player who could actually ‘play’. Central defence; the problem area of the campaign. Karl Dodd is, at best, a squad player in the league, and the two Stephen’s, O’Dor and Old, struggled to step up. Rees made a bit of a difference as Herbert went to back three midway through the season, but he is also slow. Ahmad Elrich; brought in as the marquee midway through the season and looked out-of-shape. In truth, his fitness improved as the season went on, but often he looked very isolated out on the right flank, and, worryingly, disinterested in the last few games. Ross Aloisi; driven out of Adelaide last year, he was given the responsibility here, but soon found himself on the outer again. In truth, I felt the Kiwis missed a little bit of his leadership in the back half of the year, so it’ll be interesting to see what happens to him. Cleberson; in the first half of the first game he looked the worst player ever. In the second half of that same game he looked the best ever. Played the odd game after that, but seemed to fall out of favour. Michael Ferrante and Vince Lia; The combo-deal, I’ve bundled these guys together because they were both brought across from Melbourne, where both were peripheral, and both played too many games in my opinion. Both improved a bit, but there are still massive question marks about whether they have the quality to be first 11 players at this level. Ricki Herbert; did some good and bad things. At times I felt he was too conservative, playing only one up front. For me the ‘Nix looked best when they had two in tandem up front, despite Coveny looking past his best. He also seemed a little lost about what to do with the centre of midfield and his leadership. Early on it was Aloisi, later Tim Brown, while Ferrante and Lia seemed ever-present at the back-end of the season. Off season recruitment; again, like most of the Wellington season, a bit hit and miss, but I guess, given the time they had and the players available, it can be excused to some degree. Some of the returned Kiwis were good, some of the Brazilians were good, but at the moment, other than Smeltz, there doesn’t appear to be any genuine leader. Sorting out the spine. I’ve touched on it further up, but the ‘Nix really need to sort out the centre of their defence first and foremost. Finding a couple of experienced and quick central defenders will help, but sorting out the screeners, the defensive central midfield, will also help. Up front, some genuine goal-scoring support for Smeltz would be great and, overall, Herbert needs a couple of leaders. I read this report intent on focusing more on what you would say about Felipe and Daniel (who, along with Smeltz, lifted the Nix a notch or two beyond struggler status). I agree 100% with everything you had to say about them. That aside, excellent wrap up all around.